Halloween Has Arrived In Fire Emblem Heroes! Found on Google, screenshot from Nintendo Wire. 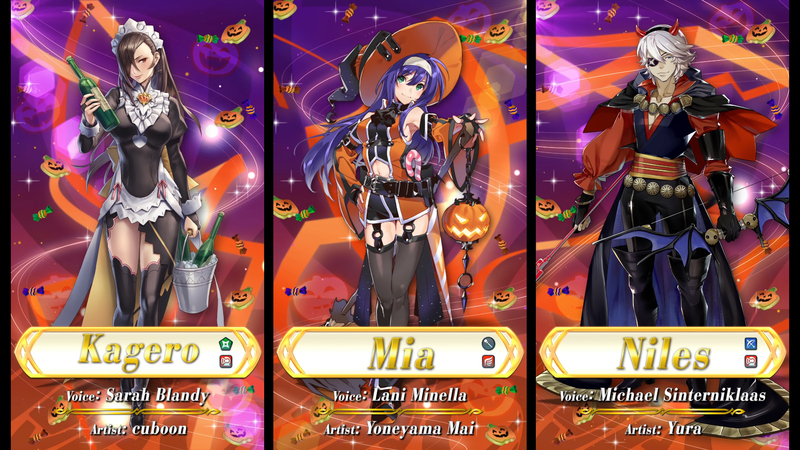 If you haven’t heard already, Fire Emblem Heroes will have a new Halloween banner released soon, starring Mia, Kagero, Niles, and Mrryh! Dorcas the Pumpkin Smasher will also appear as a Tempest Trial reward, though there is no artwork shown yet for him. Happy early Halloween! Here is the link to the trailer right here: https://www.youtube.com/watch?v=lVwORh9BwHk. Personally, Mia and Mrryh are the best of the group. If you’re not interested in them, there are a lot of banners going on right now and the first Halloween banner, featuring Nowi, Henry, Sakura, and Jakob, will likely come back as the other seasonal banners have returned from last year. Lots of armored units that score high in the arena! If you’re unsure about summoning, I’d suggest checking out Pheonixmaster1’s YouTube channel for his first impressions and stat predictions. Have a great day!